You could switch Loyall, KY with Oak Hill, WV and read nearly my same take on things. It’s strange to me that so many people look so negatively on Appalachia in general when there are just as many problems and issues everywhere. But for me, I’m proud of where I’m from and I’m proud of being a “mountain man.” What can I say, Montani Semper Liberi. I like your post here! Well said. I grew up in Cumberland till the mid 90s my parents are from Cumberland. And as far as I know my grand parents were from around there as well both parents. That’s how I see it as well. Mr. John … Just want to thank you for the chuckle I got when I read about the mothers. Very well written! I am also from Harlan County, but am quite younger (25 y/o) so, although most people know one another, we are probably not acquainted. I really enjoyed this post; I lived in Lawnvale until I was 6, then we had to move to Baxter because the Army Corps of Engineers took our property to redirect the river, like you mentioned. A lot of my family lived in Loyall for many years before that, too. I live in Richmond now (and am a high school teacher) and, while I would never move back to Harlan, I still cherish it. It has changed so much, even in the past 7 years that I’ve been gone. Anyway, great post! You are a great writer and while I blog over at Blogspot, hopefully I can find a way to follow your blog (I’m really not the best with technology). Thanks! Like all small towns, life can be easy or very hard. I found my personal and professional opportunies elsewhere, too. At your age (I’m twice your age! ), the opportunities are very limited now. All I knew of Harlan County before this was from the documentary “Harlan County USA” about the coal mines and union battles. I was shocked that people in this country lived in company housing without running water late into the 20th century. That’s where a lot of people get their view of the county. That was a very small pocket of folks in a county of 40,000 people. Yes, they did live like that, but I must point out that no one was forced to live in those houses. The vast majority of the miners didn’t live like that nor did they have to do so. I grew up in Harlan and what I remember most was what a very happy childhood my sister’s and I had. Great friendz, neighbors, teachers and friendly people everywhere for the most part. Yes, the bad lived among us too but it seemz the good folkz outweighed the bad! 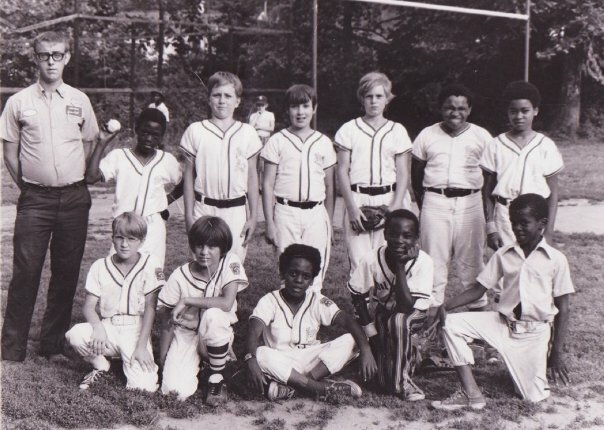 I played little league baseball for 4 yrs.on the belkz simpson team for coach Goss. We won penate 4 yrs.in a roll! Im proud of being from Harlan! Most of the people I went to school with were and still are great people! As far as the jokez about inbreedz and all that, im sure it happened but not in my family or the kidz I grew up with! People like to laugh and make jokez about southern folkz in general it seemz but if ya want to see real redneckz in action, just go to a few barz in Lexington or a ballgame and then we’ll talk about redneckz! I loved my childhood and miss a lot of the good people I grew up with! Excuse my lack of writing skillz, im sure you can all tell that I skipped english class quite often but I think I got my point across ok! I enjoy reading about Harlan and you did a good job, thx and hey to all my baseball budz and friendz from Harlan. Our team Belkz rocked in baseball 4 yrs. Strate! So very well written. I appreciate this much! I am from Pine Creek in Letcher County – the other side of the mountain. I did not know how poor, deprived and under educated I was until someone told me. When I came to UK as a junior I was told I “Slaughtered the King’s English”, But I knew in my heart that due to our pockets of isolation that I spoke nearer to the King’s English. The draw to move back is still overwhelming after 30 years. There is no place or people like us Mountain people. God Bless you for standing up for all of us. If they took all the Mountain people out of Lexington it would just fall in! True, but we have folks in Lexington that seem embarrassed about their mountain background. I’ve never been embarrassed about it–not for one second. Not me, I always tell them where I am from proudly. Just ask around there are plenty of us transplants. That family that was known as “hiding out” was my family, they lived in Smith for around 150 years. My roots relate back to an inbred family tree. I don’t see it as anything bad, they didn’t know they were marrying their first cousin or uncle for that matter. I still live here, and just purchased a house free and clear and expect to live the rest of my life here (I’m 22). Doing the best you can, friend. Isn’t that what life is about? I went to high school with the late Norman Smith who was from Smith–as fine a fellow as you ever met. wait. Brad, are you related to Greg Hobbs? with my grandparents until I married the following year. I married a coal miner. My kids went to Evarts to school. I love this place and would rather live here than any place I know of, especially Chicago! Dad, Earl Williams, was born and raised in Evarts. His sister is 95 and still lives there. My Uncle Paul is 80 and has been the Circuit Court Clerk for 35 years. I know Holmes Mill well. My goodness I loved this! I was not raised in Harlan, but spent almost every summer from age 4 to around age 15 with my Mammy (Hazel Wilson) who lived in Tremont. She was the postmaster for years on Tremont. Every person I came in contact touched my life in ways I will never forget. The kids Spent time with went to the mall, played baseball, went to the movies and so on, just like the kids in Dayton, OH where I am from. Those summers hold some of my fondest memories. My first though about this article was to put here on the comments where I grew up. But I will wait for that. This article really spoke to me. The Author was right in so many ways. Not all “mountain” people grew up in a shack, or married their cousins, or bad teeth or uneducated “hicks”. But you and I both know that that is the preconception of “hillbilly’s”. Here in Michigan where I know live. I see the same conditions where I came from. No…not all of the Northern’s are in shacks…but if for a moment….if one could put up some mountains…..you get the idea. Now I will tell you where I came from. Lynch Kentucky at the foot of Black Mountain the highest point in Kentucky. Coal mining was king. United States Steel built the town and owned all of it. I graduated from High School in Tennessee. My parents died when I was young. Mother went first, the ten years or so later Day went, from a broken heart is my guess. My dad did not mine, but I had Uncles who did. In closing let me say this….I think about home all the time. Why? Because I loved the people and the way of life. Oh we did not have it easy either, times where tough and it was unpleasant at times. But you know what? I would not trade those days for anything. Lynch Kentucky, a true American town. Thanks for reading. I grew up in Harlan County and graduated from Cumberland High School 56 years ago, but lived up the river in Blair. I remember your uncle’s “shoe shop” and many other things you mention. This was very well written and is an example of the achievements of many who grew up in our mountains. Thank you. I was raised in evarts. I had a great childhood. I didn’t know I was poor until some city kids told me. Evarts was a great place to grow up. We didnt even have to lock our doors at night. I graduated from Evarts high school in ’65 and worked for the gov. For 31 yrs. folks wouldn’t leave after graduating if there had been jobs there.i ve never been on welfare or food stamps. If people need to be that’s ok but if they re just too lazy to work then that’s not right. There are good and bad people all over the world, and it doesn’t t matter where you live, you can be what u want to be. Just takes a little effort. GOD bless you. My mother taught Home Ec at Evarts for almost 30 years. I was stranded in the Loyall fire house during that flood in ’77. I joined the army in1990 and never moved back. Yeah we were poor but never as poor as what the media portrays. Hell we had satellite by the mid 70’s and cable in the 80’s. As a kid I was secure and had more freedoms then most kids now days. Grew up in Rosspoint and went to school at Harlan City. 22 years Army, retired now. i bet you knew Art Halcomb. that fire department was his life. Good stuff man. I lived in Loyall for several years after moving from Dressen. My uncle was constable there for quite a while…lots of great memories in that town. I have enjoyed your writings so much and anxious to share your site with family and friends. I also was born and raised in Harlan Co., Benham to be specific. I left in the early 90’s. I graduated from Cumberland High School in 1978, and much of your comments bring back memories for me. I also remember your uncle’s shoe shop, government cheese (and butter). I am very proud of my heritage and always respond “I’m from Harlan Co.” when talking with people. No matter where I go or how long I’m gone Benham will always be my one true home. I am a proud coal miners daughter! Thanks and keep up the great writing. My father graduated from Loyall High School in 1953 and went into the Army soon afterwards. I’m afraid the one thing I remember about Loyall is the water treatment plant there. I lived close to the water plant. Know it well. I graduated from Loyally High School in 1955.I live in Florida now,and people still tell me I have that mountain ,accent.All tho. it has been many years ago since I lived there, it’s still home. The mountains are the most beautiful of any. It’s not often that I hear of a Loyal HS alumni. I was there for first semester of my junior year in 1954 and my teacher was Mrs Gilley. I grew up in Loyall and graduated in 1941, it’s been a while. Thanks for writing our story. Loyall High School had a band with 75 members. Some band friends were David, Maurice (Mop) and Wayne Livingston. David (PhD) became professor of Music at Western KU. Not bad for a boy from Loyall. I got to be the drum major my junior and senior years. I left Loyall in 1943 to join the Navy. I went back to Loyall this spring (2016) and couldn’t find my home over the bridge in Upper Loyall across from the L&N railyard, somebody moved the river and built a new bridge and changed the railroad to CSX. I finally found the old City Hall and RC Cola bottling plant where I worked one summer, then I found my way. I found the drug store that became a launder mat (that was closed), and the gas station on the corner with the red light, which was in your painting (now a quick shop). Then memories started coming back. Driving back up the road found Rio Vista, with a sign at the turn in. I lived down 5th street where the Saylors lived in the stone house (still there). Now you have to walk over the levee to go fish the Cumberland River. 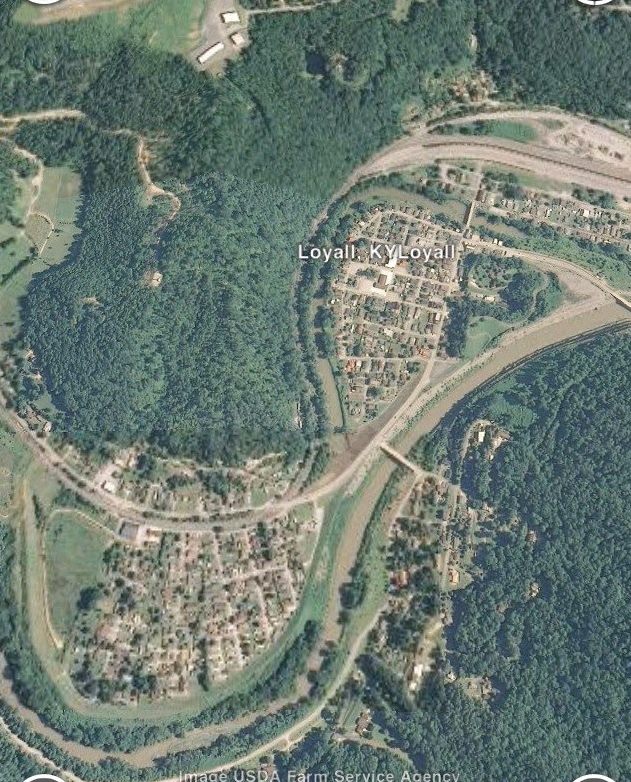 My mom and dad lived in Loyall in 1945 after the war. Dad was from Evarts and mom was from Ages. Keith King and June Wallace. My dad was from Evarts, Earl Williams. His sister Emma married a Wallace from Cloverfork. Wow, I have had Harlan on my mind for the last few weeks, since my father passed. My grandparents, Nick and Belma Brewer were amazing people and I will forever be grateful for my Harlan roots as I like to call them. I see so many things that call it a “bad place” and yes like all areas there are good and bad things about it. Thank you for highlighting more of the good than the bad! You’re grandparents were GREAT people. Mrs. Brewer was my 3rd grade teacher. I had a year in school when I had a lot of emotional problems, and Mr. Brewer–who terrified EVERY kid–took me under his wing and helped me so much. BTW, he was a little scary! Oh my what memories this brought back!!! I lived in Loyall for two years in the early 70’s. 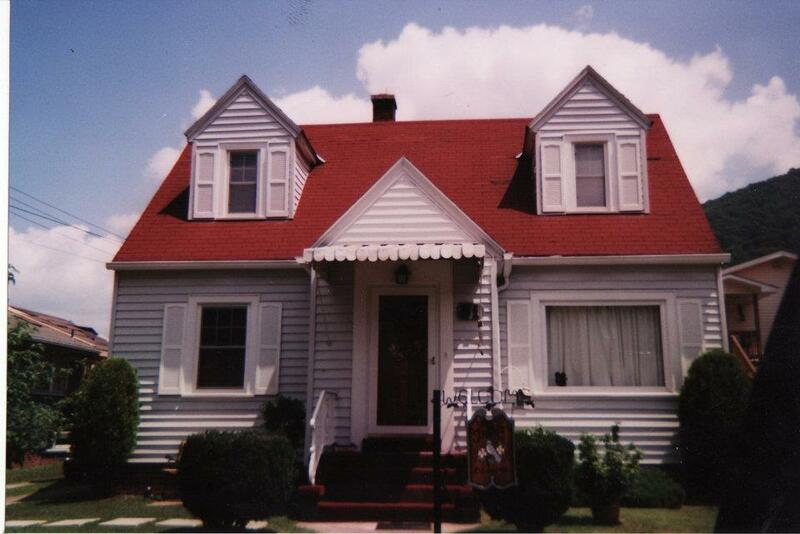 My Dad pastored the Church of Christ and we lived right by it in the parsonage. Unlike most kids who just go through life without noticing anything, I knew at the time, living in Loyall was the best place in the world to be a kid! I have lived all over the country (Florida, Georgia, even North Dakota) and I can tell you without hesitation that Loyall was heaven on earth. I loved it and have been back a couple of times to walk around and remember how things used to be. I’ve even brought my kids to show them where I “grew up”. 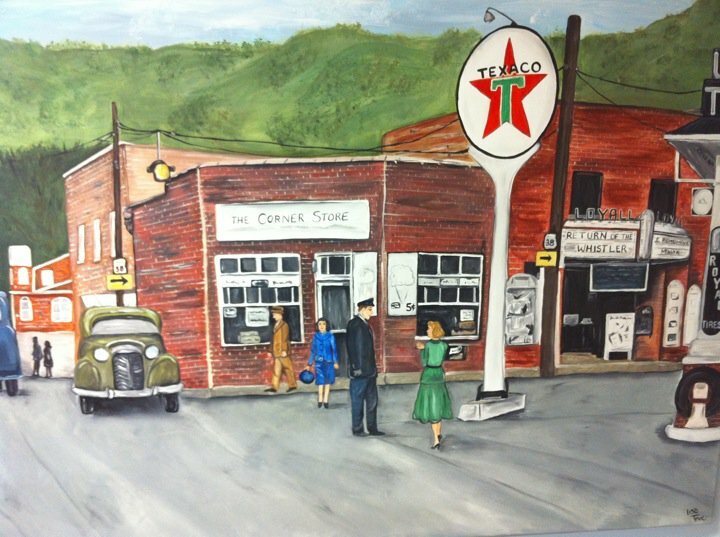 The Corner Store, Mike’s, Fox’s Grocery aren’t there anymore (as I remember anyway) but the memories live on. Open-campus lunches while at Loyall Jr. High, the Fall Festival, Little League Baseball and Basketball, Boy Scouts, my tree-house made from wood I may have stolen from my next-door-neighbor, accidently burning Unthank Cemetery (there, I finally confessed), hitch-hiking into Harlan to go swimming at the municipal pool (hope my Mom doesn’t read this), filling up on Scotty’s hamburgers after swimming all day, hitch-hiking back.. I often drift back in time and remember all the good times living in Loyall. Thank you so, so much for this blog. Great stuff!! Terry: I remember you! Glad you enjoyed my nostalgia. Man, when I looked at the name, I immediately remembered you too. I went back and looked at the baseball picture just to make sure. That’s so awesome! Do you remember the name of that Coach? I had him one season (the only one I played). Good hearing from you. You’re a great writer! Thank you for bringing back such great memories. I’m from Loyal ky. I know one thing I wouldn’t change my childhood for nothing. I was never bored and sit in the house playing video games all day. There where so many kids in Loyal and they was always enough to get a good game of fox and the hounds or any sport u wanted to play that day. Actually I wouldn’t wanted to grow up any where else. I did leave Harlan when I turned 18 because there wasnt any jobs. I now reside in Kingsport Tn. Walling Creeker here! I moved to Richmond for college, and then moved to Lexington. I get a lot of comments on my accent (didn’t know I had one until I moved up here!). I still visit my grandparents twice a month in Harlan. I really enjoyed your story, and I can relate to a lot of it as well! Does anyone know for sure if the house pictured is the one on the corner of county pike just across the bridge going into old Loyall? Looks like the house where Scott Horn lived around 1980. It’s in Rio Vista. On 1st street. I lived there until I was 12. Hey John, love from your old neighbor across the street. Darlene Brown (Lester) Actually used to babysit when you were small. You played with my Sister Kris. Perfect story. Loyall. Harlan County the place I know and love. Still here!! I remember you all. My brother Tom and Kris were big buds when they were little . I also remember you baby-sitting us! I lived in Loyall until I finished 5th grade. (1953) i lived on the street by the railroad track. My grandfather owned most of the houses as well as a store on that street. I loved Loyall and all my great friends. We didn’t know about poverty or drugs or any such thing during those days. The Corner Drug Store, church and the movie house were special to us. And the swinging bridge!!!! My law partner, Marco Rajkovich, grew up in Lynch. I also grew up in Lynch and agree with Margaret’s above comments…and yours. I enjoyed reading your piece. You did a nice job! Thanks. My law partner, Marco Rajkovich, is a Lynch boy. Enjoyed your blog! I lived in Loyall and was around 10 at the time of the flood. It was shocking to see the waters rise as my friend Karen Davenport and I roamed about. I lived in Jackson, Pikeville, Paintsville, and Loyall before moving to Central Ky, then Louisville. The long i’s are the thing people found most interesting about my accent. When I got my first job in the city, one of my fancy coworkers from Louisville was sent to audit a gun powder company near Hazard. The management team in Hazard sent him packing when he was overly amused by their culture and thought it was a good idea to make fun of their accents. In our office the chatter was, “What about that girl we just hired with the accent?” Next thing I found myself worrying about rivets on blue jeans not creating a problem for me in a powder magazine in Eastern Kentucky coal country!